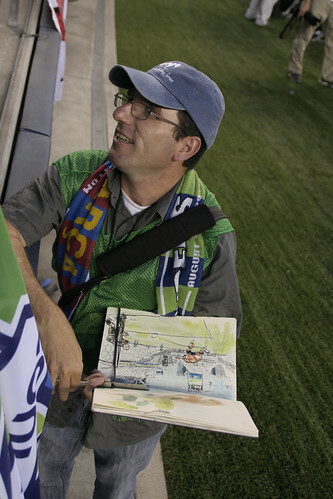 One of the best parts of being out and about sketching is meeting all sorts of people, like I did last Wednesday at the Barça – Sounders game. 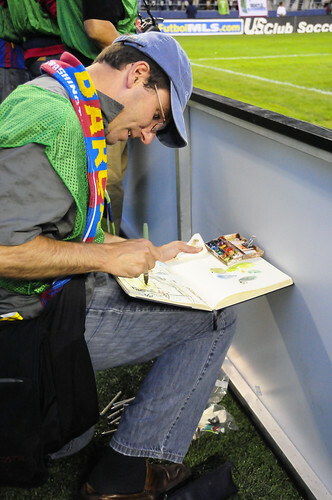 While on the field, my sketching gear was equally good for drawing attention, not just sketching, and some people approached me wondering what I was doing. Here are some photos shared by some sketcher fans! Left: Photo by Laurie Hodges. Right: Photo by Steve Portugal, webmaster at Seattlefutbol.com. If you don’t catch me sketching in person you can follow me on Facebook and Twitter. Drop me a line. I always welcome sketching suggestions.